Santa Lucia Foundation, Rome, February 21, 2016. Chiara Insidioso Monda 21-year-old and her father Maurizio, 44. 21-year-old Chiara has been hospitalized at the Santa Lucia Foundation in Rome since December 2014. 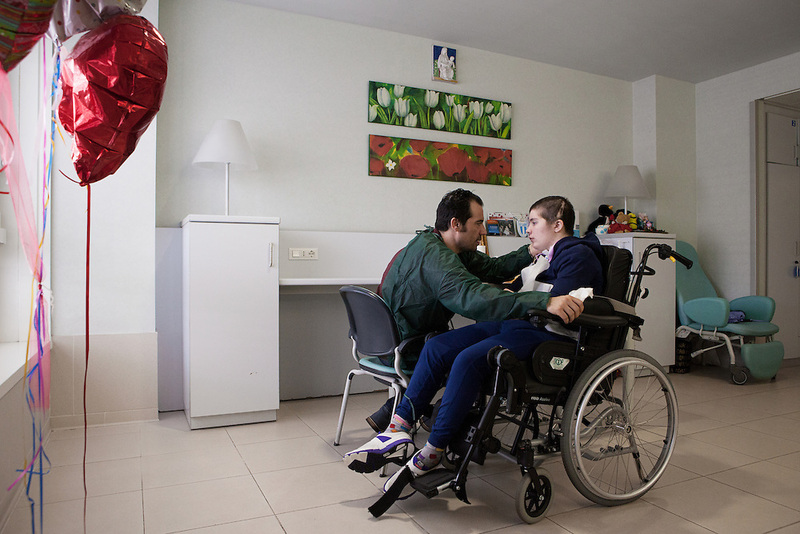 In February 2014, when Chiara was only 19, she was brutally beaten by her ‘partner’, 16 years older than her, till she fell into a coma due to the violence of the blows. The kicks, punches and having her head slammed against a wall caused irreversible damage to Chiara’s body and reduced her cerebral functioning to 10%. Chiara had to undergo three brain surgeries when she arrived at the hospital. She woke up from the coma after 10 months and is now in a state of semi-consciousness. This means that she can’t talk, move or walk and has to be assisted in every single activity of daily life. Fondazione Santa Lucia, Roma, 21 Febbraio 2016. Maurizio incoraggia la figlia Chiara durante il pranzo al Santa Lucia. Chiara impiega ogni giorno più di un’ora a terminare il pranzo, che deve essere ingerito lentamente, facendo molta attenzione che non vada di traverso.